In today’s time, when English has been instituted as a global language, it is important that we are fluent in writing and speaking the language. And, as it is essential in any language, a comprehensive understanding of how words are formed is important to have a sharp command on the English language. Majority of English vocabulary is actually based on Latin and Greek roots only. New words are created by adding prefixes and suffixes to these existing root words. Knowledge of root words, thus, will help you memorize numerous English words easily and decipher their meanings as well. 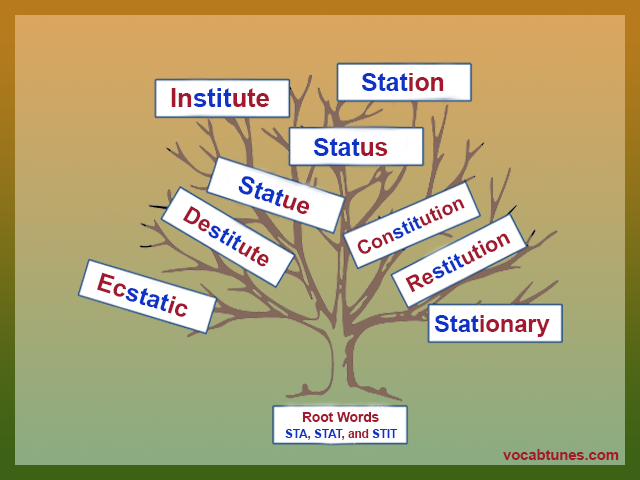 Today, let us discuss about a widely used Latin root word ‘Stat’ and its spelling variants ‘Sti’ and ‘Sta’, which mean ‘stand’ or something which is not moving. It is a known fact that a child’s mind, more often than not, grasps bits and pieces of any information rather than the whole thing at a time. Therefore, be it a teacher or parents, making kids learn to read and understand different words can be a great challenge. This is where Vocab Tunes comes to your rescue. This online reading program is the perfect prescription for enhancing your child’s English vocab words learning capabilities. Based on root words, it is one of the best approaches to improve vocabulary and inscribe different words in young minds. Also consisting of root word songs, the program will help to script the way your kid remembers different words and spellings. 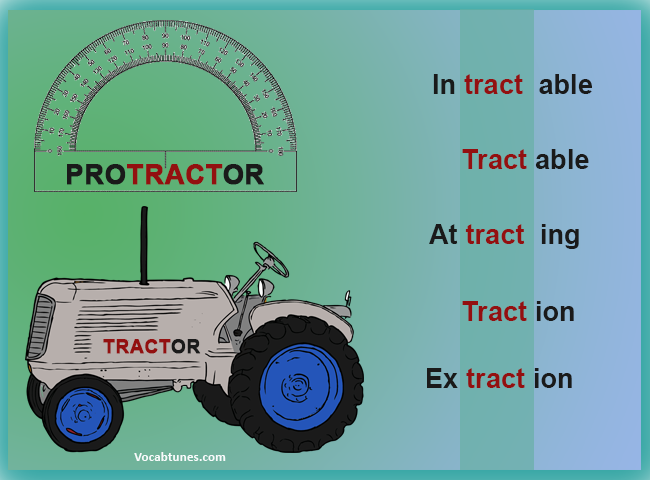 Aren’t we all familiar with that plastic semicircle called ‘Protractor’ while we study geometry or that very powerful vehicle for farming called ‘Tractor’? Have you ever wondered where from these commonly used terms come? You will be amazed to know that both the words have their root back to the Latin verb trahere or ‘tract’, which means pull or drag. Infact, majority of our English words have actually been borrowed from Latin. 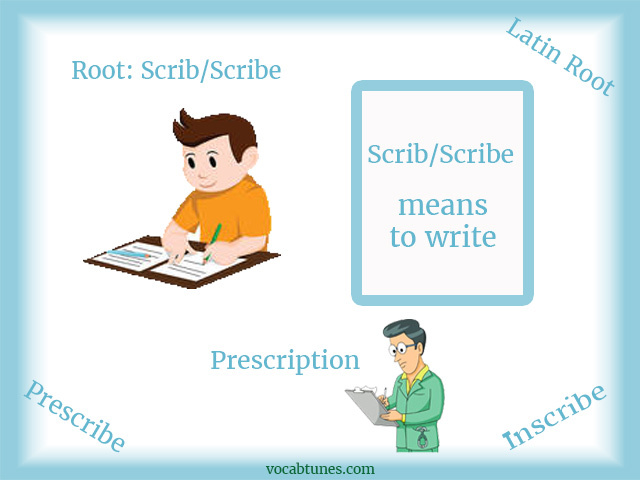 Therefore, learning these root words becomes one of the best ways to improve English vocabulary. Taking an online course or attending an English class can definitely enhance the vocabulary of your kids. But don’t these approaches get tedious and subsequently take its toll on young brains? In a world where everybody is talking of innovations and being smart, for sure you would want an easy, fun way to help your children build English vocabulary. How about songs, dancing, and building your lexis all at one go? Let’s start the ball rolling with one of the Vocab Tunes’ songs ‘Get Carried away’, comprising a widely used Latin root word ‘Port’. The word ‘port’ means ‘carry’. If we add prefixes such as im- and ex- before ‘port’ then it will create two new words import and export. Here, both words convey the same meaning ‘carry’ but are used differently. When one state imports goods from another state, it ‘carries’ them into its own land. Conversely, exporting goods mean to ‘carry’ them out from one state to another. Have you ever wondered that understanding the Latin roots and searching for new English words can be great fun? Learning only the root-words will surely help your kids build familiarity with thousands of words. So tapping our feet to the tunes of ‘Move Along’, let’s see how we can ‘hold’ the root ‘ten’ in our memories. A root or a root-word is a basic word with no prefix or suffix added to it. 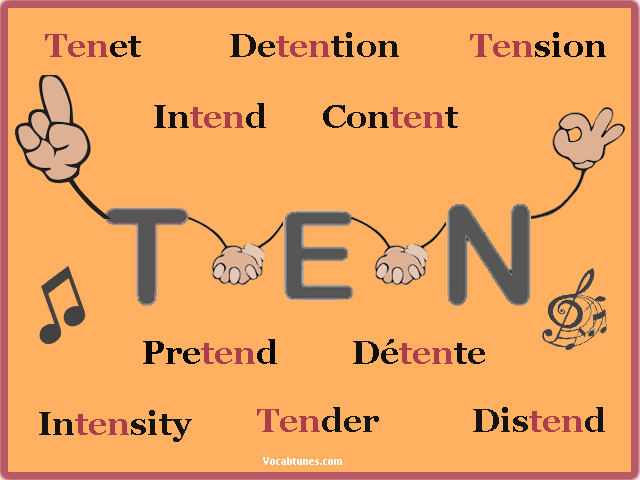 The Latin root word ‘ten’ means ‘hold’. An easiest way to remember this root is through the word ‘tenant’, which means the ‘holder’ of the lease. The root words ‘tend’, ‘tens’, and ‘tent’ also come from the Latin, meaning ‘stretch and strain’.